Conversations on how to reform healthcare are long-standing and varied. But healthcare costs have soared, health insurance companies get richer and even those who pay dearly for health insurance frequently find that their policies don’t adequately cover them when they need their coverage most. 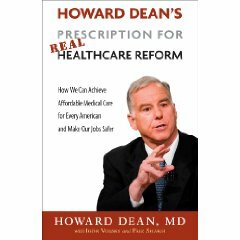 Howard Dean—physician and former chairman of the Democratic National Committee (DNC)—served six terms as Governor of Vermont before running for the Democratic Party’s presidential nomination in the nation’s 2004 election. Dean also founded Democracy for America (DFA), the grassroots organization that organizes activists in local communities, trains campaign staff, and endorses progressive candidates. Recently, Dean launched a DFA healthcare reform campaign—pushing legislators to give Americans a public healthcare option. While he was Vermont’s governor, the state expanded its universal healthcare program for children and pregnant women—and also lowered its public debt, balanced its budget 11 times, and reduced income taxes.